One couldn’t really ask for better weather for the February 20th 2017 Nature NL snowshoe trip – not too cold or windy, with sun and blue skies and, of course, plenty of snow! The snow not only covered the ground and the tree limbs, but also coated the tree trunks creating quite a winter wonderland. 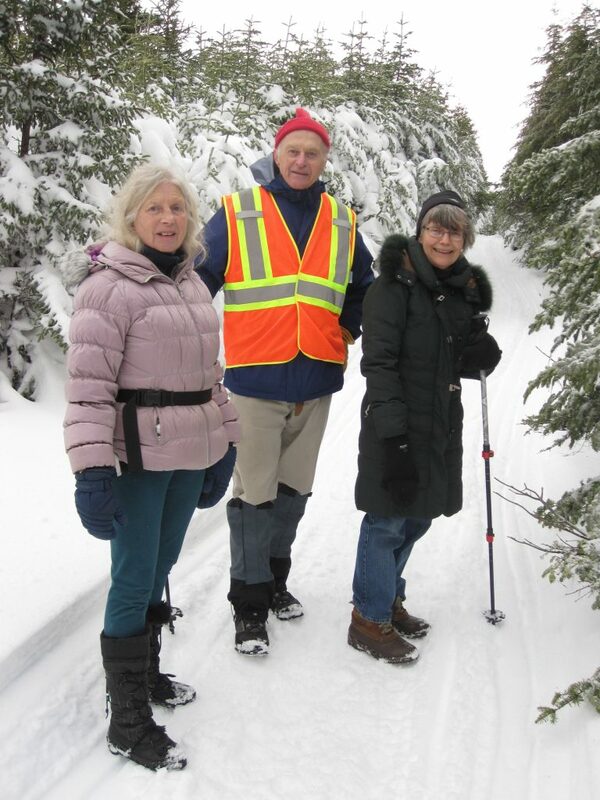 Even though the snow was very deep we decided not to use snowshoes as on the main trails snowmobiles had packed the snow down enough to walk on just in boots. The area was dense woodland mostly covered with conifers and an occasional dogberry. As one might have expected snowshoe hare tracks were abundant, many smaller than might be expected. Allan pointed out that hares give birth to young around this time of year hence the many smaller sets of hare prints. Besides buds snipped off by hares close to snow level, there were also a number of smaller deciduous shrubs where the bark had been scraped off by hares near the base. On several occasions we heard the sounds of a moose ahead of us although we didn’t actually see the animal. There was, however, plenty of evidence of moose feeding as many of the dogberry buds had been snapped off by moose. In one area we came across a set of dog-like tracks which did not show the aimless wandering of a dog and which were too small for a fox. We concluded that the tracks were those of a coyote. Towards the end of the trip the sun came out from behind the clouds creating a real life Christmas scene with the snow decorating the conifer branches. In places the sunlight shone through icicles hanging from the trees giving the appearance of multicoloured Christmas tree decorations! All in all a very enjoyable stroll through the woods among wonderful natural scenery!